Using chess as a tool for childhood success. At the 2011 National School Chess Championships, New York City schools dominated in all age categories. New York’s best elementary school team demonstrated how powerful the city’s scholastic chess scene has become by beating opponents nearly twice their age. The Panda Pawns from P.S. 124 in Manhattan won top honors in the second-toughest division. “New York teams are so dominant, they might as well call this the state championships,” Matthew Noble, a chess coach at a school in Tucson, Arizona, said during the tournament. Chess has entered New York schools, both as part of the curriculum and as an afterschool activity. It provides a large pool of talent for local tournaments at which young players gain competitive experience. Immigrants from cultures where playing chess is a national pastime have helped popularize the game in New York City. They foster interest in the game as parents and often serve as instructors. During the school year, tournaments are held every weekend. The purpose of tournaments is to expose kids to more players so they can gain experience vying against a wide range of strategies, which helps players become better at the sport. Kids are encouraged to understand all the rules before playing in a tournament. Robust instruction isn’t limited to private schools. 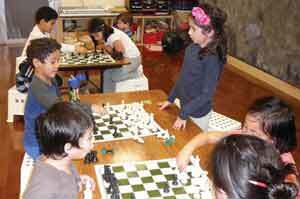 The nonprofit Chess-in-the-Schools is Manhattan’s largest provider of chess instruction for afterschool settings and curricula. The organization works with 13,000 students at 50 schools that serve low-income populations. The organization also trains teachers on how to start chess programs. It’s just one of several organizations in New York working in schools and setting up tournaments. While the vast majority of kids don’t advance far in tournaments, they are still able to enjoy learning the basics. Parents and educators see how learning chess can help children develop critical thinking skills and other academic and non-academic abilities. Children who play chess learn to see patterns, solve problems, plan ahead and to think before they act. If you don’t pay attention in school, you might not see the consequences right away. But if you lose your queen in chess, it forces you to pay immediate attention. Although playing chess encourages a great deal of concentration and interaction, the best part about the game is that children find it fun to play. Most children love games. And chess motivates kids to become willing problem solvers and spend time quietly immersed in logical thinking. Yet, many of these same young people often cannot sit still for 15 minutes in a classroom setting. Furthermore, many studies demonstrate that students who participate in chess programs show improved scores on standardized tests. The gains are even greater among children with low or average initial scores. In chess, you win and you lose. While you have to be competitive, you understand that having an opponent is OK. These are important life skills to grasp that have been removed from many traditional academic activities. The average student has much to gain from learning how to play chess without performing enormous chess calculations. When compared to other games, chess provides a far greater quantity of problems for practice. One of the largest chess books ever written, Chess: 5334 Problems, Combinations and Games (Black Dog & Leventhal Publishers) by László Polgár, the father of three chess prodigies, has more than 5,000 puzzles. There are also thousands of other chess books, making it easy to find one that appeals to your kids. Chess-playing students become accustomed to looking for different alternatives in games and puzzles, something many chess books provide. In his book Your Child’s Intellect, (Olympus Publishing Company) former U.S. Secretary of Education Terrell Bell encourages some knowledge of chess as a way to develop a preschooler’s intellect and academic readiness. Igor Postelnik is an U.S. national chess master. He and his wife Irina manage Long Island City Kids Enrichment Center, where they offer chess classes. For more information, visit www.lickids.com.